An immunotherapy was found to be effective in achieving long-term survival in some lung cancer patients. It has emerged to searching for new immune biomarkers for select the best candidates to this therapy. It is suggested that cancer stem cells (CSCs) are responsible for tumor initiation, maintenance and its metastatic potential. However, a role of CSCs in escape of cancer from immunosurveillance is unknown. The aim of the study was assess the phenotype of putative CSCs and to examine the expression of PD-L1 on CSCs in metastatic lymph nodes (LNs) in lung cancer patients. Flow cytometry was used for CSCs evaluation in peripheral blood and EBUS/TBNA aspirates from N1,N2 lymph nodes in lung cancer patients. Of 30 patients the LNs metastases were confirmed in 18 patients. We noticed presence of PD-L1 on putative lung CSCs- CD133 + EpCAM+ cells. A higher percentage of CD133 + EpCAM+PD-L1+ cells was observed in patients with metastatic in LNs- median value = 4.38% than in patients without LNs metastases– median value = 0,015% (p < 0.05). The highest proportion of PD-L1+ CSCs was found in adenocarcinoma patients and in those with oncogene addiction what indicate an particular biology of this type of lung cancer. The presence of CSCs with expression of PD-L1 in the metastatic LNs might suggest their immunogenic potential. EBUS/TBNA is commonly used in diagnosis and staging of lung cancer, so the analysis of the cells in metastatic LNs may fit in “immunoscoring” before immunotherapy. • Lung cancer stem cells- CSCs could be responsible for escape from immunosurveillance. • CSCs are identified by expression of CD133 and EpCAM. • CD133+EpCAM+PD-L1+ cells are found in EBUS/TBNA samples of lymph nodes. • Proportion of CSCs PD-L1+ is elevated in metastatic lymph nodes and in adenocarcinoma. Marta Dabrowska MD, PhD, and Rafał Sokołowski MD for the help in EBUS/TBNA performing. http://gco.iarc.fr. Accessed 6 Oct 2018. Domagala-Kulawik, J., Kwiecien, I., Pankowski, J., et al. (2017). Elevated Foxp3/CD8 ratio in lung adenocarcinoma metastatic lymph nodes resected by transcervical extended mediastinal lymphadenectomy. BioMed Research International, 5185034. https://doi.org/10.1155/2017/5185034. Regenbrecht, C. R. A., Lehrach, H., & Adjaye, J. (2008). Stemming cancer: functional genomics of cancer stem cells in solid tumors. 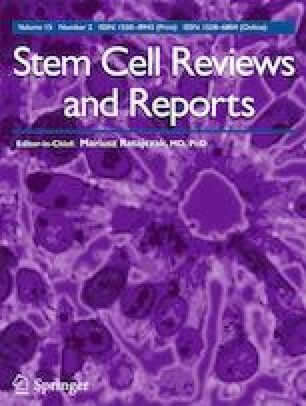 Stem Cell Reviews and Reports. https://doi.org/10.1007/s12015-008-9034-0. Sales, K. M., Winslet, M. C., & Seifalian, A. M. (2007). Stem cells and cancer: an overview. Stem Cell Reviews and Reports. https://doi.org/10.1007/s12015-007-9002-0.